Simatic Energy Manager Basic V7.1 Energy Management App provides interface to Simatic S7 Energy Efficiency Monitor to assess the machine and plant efficiencies. The app is designed for iOS and Android, which allows user to record the data of energy consumed. The App provides energy transparency using web-based engineering and data connection and communicates with MindSphere, cloud-based and open IoT operating system. 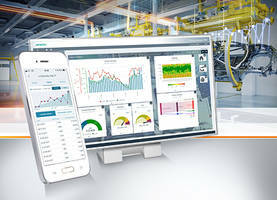 Siemens has expanded its ISO 50001 certified energy management portfolio to include Simatic Energy Manager Basic V7.1. Designed for entry-level energy management, Simatic Energy Manager Basic offers the user energy transparency quickly created by web-based engineering and data connection. The customized design of dashboards and reports enables initial efficiency measures to be derived quickly. If the requirements increase, for example in the direction of batch or material-related analyses, baseline management or energy consumption forecast, the user upgrades to energy management with Simatic Energy Manager PRO V7.1 simply with a license key. Simatic Energy Manager PRO V7.1 now offers not only extended analytical possibilities, but also additional interfaces, such as that to the Simatic S7 Energy Efficiency Monitor for assessing the efficiency of machines and plants. This is a step toward the energy labeling of industrial plants and machines. Also new is the connectivity to the MindSphere, the cloud-based, open IoT operating system, for further analyses. Siemens has brought the Simatic Energy Manager V1.0 app for iOS and Android onto the market to provide the simple, intuitive mobile recording of consumption data. The user uses them to record the consumption data that are not or cannot be networked with the energy management system. The counter is identified by simply scanning the QR or bar code, and the corresponding count value is entered. Direct data validation enhances the quality of the data. Simatic Energy Manager is used throughout companies and across sites in industry and production for certified energy management according to ISO 50001. Companies use the energy management system from Siemens for optimized and economical energy management. Simatic Energy Manager PRO provides support for the efficiency analysis of machines and plants, company-wide energy efficiency controlling, cost center billing, and optimization of the energy procurement. Energy flows and consumption can be made transparent and understandable in all areas of a company. Simatic Energy Manager is easily set up and configured for the particular application – both for interaction with the automation and for recording data manually. Pre-defined templates for reports and configurable dashboards support reporting.